Searching for quality used auto & truck parts in the Hickory & Claremont NC areas? Matlock Used Part's newest location is a "State of the Art" full service auto salvage and recycling facility. With over 200,000 square feet of warehouse space, Matlock's Hickory-Claremont NC location is virtually an "indoor" auto salvage yard! We welcome you to stop by and visit our very unique and impressive facility and see firsthand why Matlock's is considered to be one of the top auto salvage yards in NC and the US. Are you looking to sell a wrecked, salvage or junk car, truck, van or SUV in the Hickory NC or Claremont NC areas? Matlock’s buys all types of vehicles for parting out and recycling. Give us a call or submit our Vehicle Quote Request Form and receive a great price quote for your vehicle today! Matlock's is a full service used auto parts and auto recycling company serving NC, SC, VA and the entire US via nationwide shipping including: Hickory, Charlotte, Greensboro, Statesville, Winston Salem, Asheboro, Asheville, Cleveland, Claremont, Taylorsville, Salisbury, Mooresville, Kanapolis, Concord, China Grove, Lincolnton, Gastonia, Huntersville, Cornelius, Denver, Lexington, Mocksville, North Wilkesboro, Clemmons, High Point, Mt. Airy, Elkin, Yadkinville, Siler City, Cherryville, Morganton in NC, Martinsville, Danville in VA. We stock thousands of used parts for most makes, models both foreign and domestic including: Engines, Transmissions, Axles, Rear Ends, Starters, Alternators, A/C Compressors, Radiators, A/C Condensers, Cooling Fans, Transfer Cases, Wheels, Tires, Auto Body Parts including: Front Ends, Hoods, Fenders, Grilles, Front Bumpers, Headlights, Fog Lamps, Turn Lights, Doors, Body Panels, Taillights, Rear Bumpers, Deck Lids, Quarter Panels, Interior Parts and almost any used part on a salvage vehicle. We also buy local wrecked, salvage & junk cars for recycling. 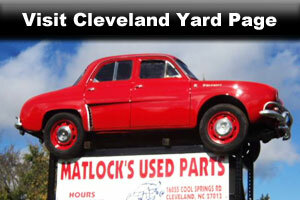 Matlock's Used Auto Parts in Hickory-Claremont NC.